Poe Ghostal here, formerly of Online Action Figure Entertainment, with a review of three "Movie Monster Series" vinyl toys from Bandai. As anyone who's read my OAFE work knows, my reviews tend to run a bit long; but I've faithfully adhered to Michael's basic review paradigm, so feel free to skip the preamble and scroll down to the category evaluations. In some ways, I was a pretty precocious kid when it came to toys. While other kids were content to bash two rubbery Imperial dinosaurs against one another, I preferred to play with a Godzilla '62 figure. This was back in 1984 -- ten years before the "McFarlane Revolution" in American toys. When McFarlane's sculpting began to push the American action figure industry to higher standards, I wasn't that impressed -- I'd seen that level of sculpting on my Bandai Godzilla figures for years. 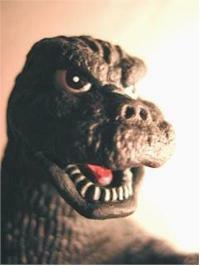 For a vinyl figure, any given Bandai Godzilla figure contains an impressive amount of detail. 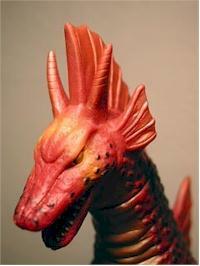 Over the years, Bandai (whose most successful American product has been, by far, the Power Rangers line) has only increased their skill at creating vinyl versions of Toho Studios' kaiju (Japanese for "mysterious beasts" and the term used to describe Godzilla, Ghidorah, Mothra, Gamera, and any other giant Japanese monster collectively). 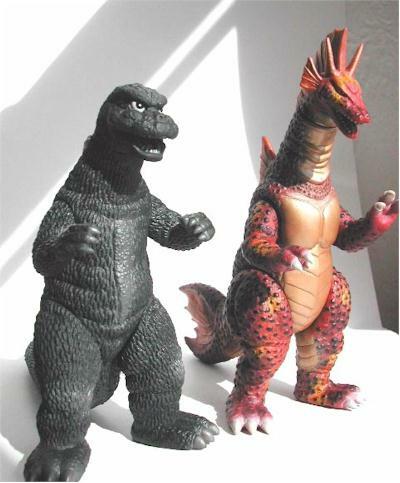 Bandai has released their Toho figures in a variety of styles and formats, but the vinyl (or rotocast) figures (which varies between a 6" and an 8" scale) remain their flagship line. 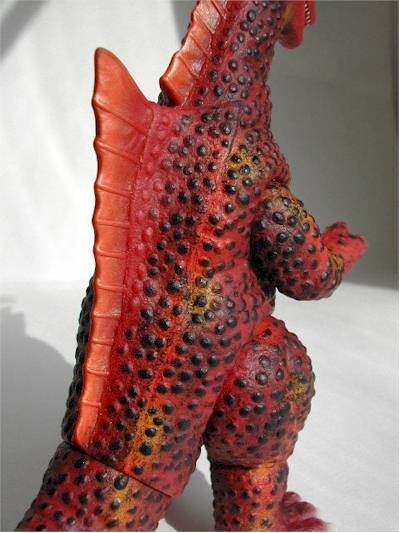 In late 2002, after years of lackluster Godzilla toys from Trendmasters, Bandai tried to establish a beachhead in the American Godzilla market with "Bandai Creations," a series of 6" vinyl Godzilla toys. Appearing in comic shops and Kay-Bee toy stores, the line contained four figures: Godzilla (1954), Mothra, "Burning" Godzilla, and American fan-favorite Gigan. Unfortunately, the line was a failure (probably due to its relatively high price point of $8 and old-fashioned bad timing; Godzilla's American popularity had waxed and waned in the mid-to-late '90s and suffered a terrible blow with the awful American film in 1998). Bandai cancelled a planned second line of the toys and pulled out of the American market. Or so it seemed. I stopped collecting -- and thinking about -- Godzilla many years ago. Two Bandai vinyls remained in my "toy shrine" at home (along with Masters of the Universe figures, Transformers, Robo Force toys, and a few Ninja Turtles). But several weeks ago, I was idly pawing through the vinyl figures at Newbury Comics (a Massachusetts-based chain of pop culture stores) and discovered, to my shock, a Bandai figure of the 1974-era Godzilla. Some context: the 1974 film Godzilla vs. MechaGodzilla and its 1975 sequel, Terror of MechaGodzilla, were always my favorite Godzilla films. They featured a "good guy" Godzilla, a giant evil robot Godzilla, and two supporting-actor monsters, King Seesar (in the first film) and Titanosaurus (in the sequel). Though many Godzilla fans are not fond of the campy, children-oriented Godzilla films of the '70s, I loved them -- and still do. The "puppy face" of the Godzilla suit used in these films is a particular target of derision for die-hard fans, but I'm fond of it. I'd always wanted a Bandai vinyl of that particular Godzilla, but despite 1962, '64, and '84 versions of Godzilla, there was no Godzilla '74 (allegedly because Toho wanted to wipe that era from memory, though Bandai did produce figures based on MechaGodzilla and King Seesar). 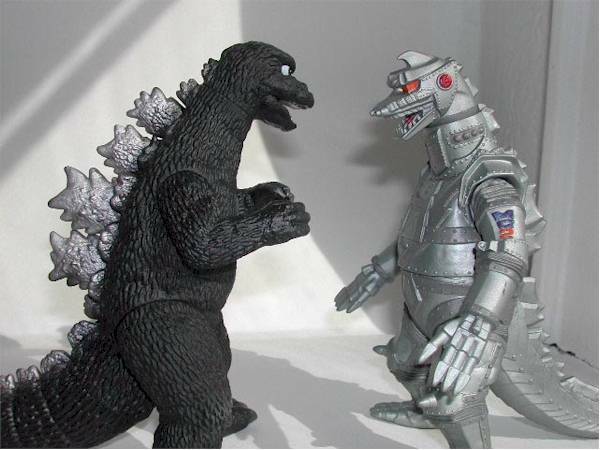 But over the years, largely due to pressure from American fans (who knew the MechaGodzilla films well from its years in syndication in the U.S.), Bandai and Toho caved in. 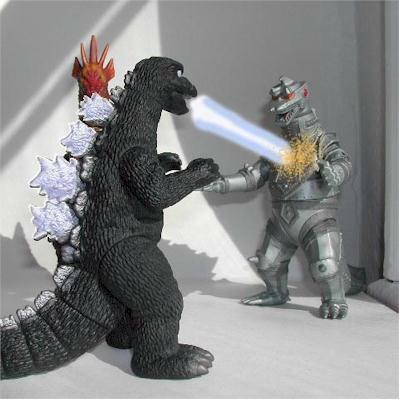 In 2002 they released a Titanosaurus figure and a MechaGodzilla '75 figure in their 6" line, followed in late 2003 by the Godzilla '74 figure I discovered in the bin at Newbury Comics. I'm not sure why these vinyl figures have been popping up at such stores across the country, but I'm glad they have. My renewed interest in Godzilla has, among other things, given me an idea for my master's thesis. In return, I'm writing this review to help get the word out about these great toys. But (*ahem*) enough preamble. Let's get to the review. There is no packaging, per se. Like all Bandai vinyls, these figures come with a paper tag attached by a plastic thread, no more. The tags pop right off, but they will leave a tiny, unnoticeable hole in the figure. As mentioned above, I discovered these figures in a bin at a pop culture store, along with a bunch of other vinyl monsters (including X-Plus's Ray Harryhausen vinyls). For a $14 import figure, this is pretty inconsiderate of the store; my figures had some minor paint rubbing and scratches here and there. That said, the other Newbury Comics near my home town had all their vinyls standing on display, so perhaps it's just a quirk of my local store. Yes, fours across the board. I usually avoid raves, and plenty of Bandai's vinyls have been less than perfect. But the sculpts on these figures are amazing. Godzilla '74 is a perfect rendition of the "Megaro-Goji," as this suit is known. The puppy-dog eyes, the loose-looking spikes -- even Godzilla's head seems cocked at just the right angle. Yes, this Godzilla resembles a muppet (perhaps Cookie Monster? ), which I realize isn't everyone's cup of tea. But that's not Bandai's fault. 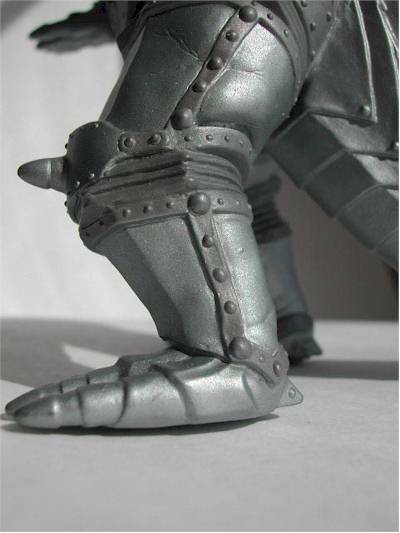 This figure is so accurate, the spikes are actually molded from a separate piece to represent how they would be Velcroed back into place once the actor was inside. 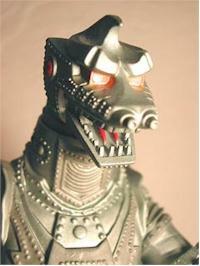 MechaGodzilla '75 does Godzilla one even better. As you can see from the picture, the sculpt is so accurate, Bandai included the wrinkles in the foam suit of this "metal" monster. The pose is good as well, with one hand in a horizontal position and the other in the vertical. Titanosaurus, however, tops them all. Not only is this an amazingly accurate sculpt of an obscure kaiju; but the sculptor actually included the flap on the creature's back where the suit would be zipped up (see pic). For 6" scale figures, the paint applications on these toys are nothing short of amazing. Compare the painfully detailed, intricate work on Titanosaurus to the splotchy paint of Toy Biz's much larger Legolas rotocast and you'll see the difference. There's not much work necessary on Godzilla or MechaGodzilla, though the latter has some nice work around the shoulders and eyes. But Titanosaurus is a wonder. Bandai nailed the monster's golden chest, shining, fish-like eyes, and pebbly skin (the skin, incidentally, always makes me think of Pizza Hut pizza). Along with the sculpting, the paint apps are the best reason to recommend these toys. Each figure moves at the neck, shoulders, and legs, and Godzilla and Titanosaurus move at the tail. The neck and arm articulation is useful (and well hidden), but the legs and tail are pretty much worthless. 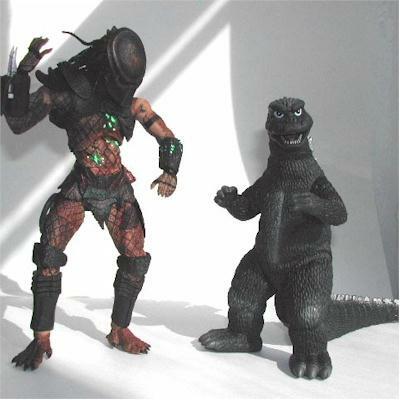 Granted, on sculpts of "natural" creatures like Godzilla and Titanosaurus, too much articulation would ruin the sculpt. Also, articulation is difficult on vinyls, especially in this 6" scale. Personally, I don't mind, but it's a consideration, particularly when you're being asked for $11-$14 for a 6" figure. No accessories with these guys. What do you want? They're monsters. A few buildings or some miniature tanks might have been nice, but without packaging that's not exactly feasible. I admit $14 a pop for 6" vinyl figures isn't exactly a steal. The only defense I can offer is that these are imported figures. However, after one considers the quality of the toys and what such a figure might cost if made by a American company versus the import factor, these toys begin to look like a steal (or at least a deal). Other than the price issue, I can't recommend these figures strongly enough. I'd say they are a must for any Godzilla fan, and should at least be a consideration for a fan of monsters or toys in general. Clawmark Toys -- a favorite of Godzilla fans, Clawmark not only has Bandai vinyls but also dozens of other kaiju-themed Japanese imports, including PVCs and model kits. ChibiGoji Toys -- also very popular, with competitive prices. The Godzilla Shop -- probably the closest thing to an "official" Godzilla store, with plenty of Godzilla toys as well as Gamera, Ultraman, and other Japanese products. Figures from the collection of Poe Ghostal.